Since moving into the bigger barn and the erection of the scaffolding the trust has been able to make the working area far more compatible with the project. Having the entire work area covered with plastic sheeting surrounding the walls and barn roof has meant that the time available for working could be expanded. The trust paid to have the barn professionally wired to facilitate better lighting and heating, and regularly contributed towards the electricity costs. The project is mainly centered around the restoration work but that only forms part of the project as behind the scenes quite a bit of additional work is needed. The trust is under no illusion that getting the lifeboat restoration completed is going to take a substantial effort both physically and financially. Quite a bit of the work can be facilitated with the help of volunteers, however, some of the work is really the domain of professionally skilled craftsmen. 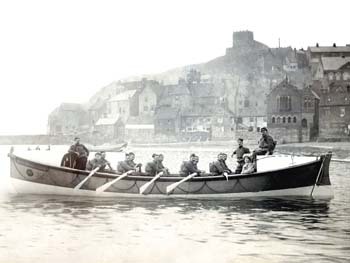 The Whitby Historic Lifeboat Trust was delighted to be informed that the bid for Heritage Lottery Funding of the project to restore the former lifeboat had been successful and that the grant amounted to £44,800. The trust initially sought financial support in order to meet the expenses likely to be incurred, however with the generous Lottery grant it is no longer as important as it once was. Once the boat was withdrawn from active service it spent a short time in storage before being sold on to Mr B. Green Street of 4 Miller Road, Walthamstow for just £35. He spent some cost in converting the boat into a motor cruiser. The photograph to the left was taken at Stourport and shows the stark difference the lifeboat looks as opposed to her time as a lifeboat. There was talk that the William Riley may once have been one of the infamous "Dunkirk Little Ships", although research I have conducted has yet to confirm this is the case. It would be nice to know the boat had played its role in one of history's defining moments. By the 60's the boat was situated at Redstone wharf on the River Severn, it ownership was transferred to a builder in Stourport in 1982 and the boat underwent what was perhaps its first restoration, albeit with some re-planking and a new engine. In the late 80’s or early 90’s the boat was moved to Devon and moored at Barnstaple. In 2001 William Riley was once again sold on, after having been towed in by the RNLI as a result of engine failure. Sometime later the boat escaped its moorings and was swept into a low bridge at Barnstaple virtually taking off the wheelhouse. The boat was moored on a grass but sadly impaled itself on a unused mooring post on one of the low tides, the result being two gaping holes in the hull below the waterline. It could be considered that the end of the William Riley was not too far away as its owner could not meet the costs needed to fully repair the damaged hull and the boat was left to its own devices. As history now knows the boat was facing certain destruction until it was found and returned to Whitby. The trust was keen to follow up tracing family members of the original benefactor as it would like to arrange for at least one family member to be present when the restoration of the lifeboat is completed. It was quite a surprise to find one of the family members was going to be present as the restored lifeboat made its way into Whitby after the fundraising row. I have a close friend that is a very keen lifeboat enthusiast, something that quite possibly stemmed from her grandfathers role as a lifeboat coxswain. She frequently visits me and when she found out that I was one of the founding members of the "Whitby Historic Lifeboat Trust" as a trustee she presented me with large original print of the William Riley. The print is believed to have been captured around the time of the lifeboats dedication and is quite unique, it is feasible that the lady sitting to the rear of the lifeboat might have been a close descendant of "William Riley." The prints are scare and rarely surface, I feel more privileged that mine came by way of a direct connection to Whitby's lifeboat station and not simply bought as it undoubtedly gives the original print more provenance. The print was faded as one might expect given its age,but the lifeboats name can be clearly seen. I have been able to scan the print into my computer and clean it up before having the 'cleaned' print printed commercially. After its closure the Upgang station was dismantled and is now recalled in photographs. During the removal of the station some of the wood was collected and used for a variety of purposes. The chair pictured left is made from wood salvaged from the wooden launching ramp at the Upgang .lifeboat station. It is a treasured memento in the hands of the ex chairman no doubt in his role as custodian for the lifeboat museum.